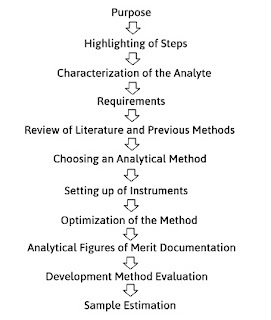 An analytical method is developed using many steps. 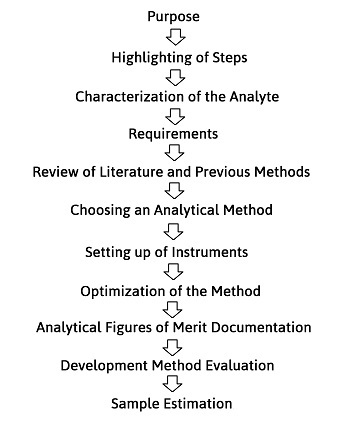 These are the steps which are followed during the development of an analytical method. Analytical methods in chemistry context entail how chemical components in natural materials or synthetic materials are identified, separated and then quantified. Analytical method development is a process whose main purpose is to prove if any analytical method in the pharmaceutical industry is suitable to be used in the measurement of API. In the pharmaceutical industry, analytical method development gives important information on the potency of a drug, the drugs' bioavailability, the drugs' stability and also its effects. In the very first step, the purpose of conducting any Analytical Method Development is established. In the second step of Analytical Method Development, the steps involved in the development are recorded in a laboratory book. In this step, both the biological and chemical properties in addition to the physical properties of the analyte are collected. After that, the analyte is obtained and stored according to its specific requirements. The methods for analysis are then recorded with an example being the chromatography technique which employs different methods such as the High Performance Liquid Chromatography. Requirements for the method development of the analysis are done and recorded. All the materials, reagents and instruments are procured those are required for the analysis of the sample. 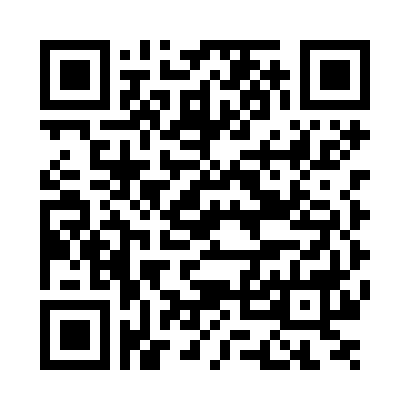 All literature information related to the specific analyte e.g. a specific drug is assessed for any biological, chemical and chemical properties regarding the analyte. Reference is then made from journals, books and any other publications. From the information obtained from the literature during the literature review, a specific methodology is modified to cater for accurate output and also because methods change with the requirements of the analyte. If there are no previous methods in the literature being reviewed regarding the analyte, the procedure goes on uninterrupted. Appropriate instruments for the analytical method development are set up in the laboratory by each of the instruments standard operating procedures. Standard Operating Procedures usually abbreviated as SOP's are a set of instructions or steps to aid in performing a specific procedure in a laboratory set up. They are usually universal and standardized for ease of use in any laboratory set up. In carrying out the optimization of the analytical method, parameters are changed individually depending on the arising interests. Optimization of an analytical method is done in reference to a systematic and procedural plan while making sure to critically follow all the documented steps. Documentation of the analytical figures of merit decided upon is done. These analytical figures of merit include quantification limits, detection limits, analysis time frame, operational costs and sample preparation. The resultant product of analysis should give a desirable result as expected in the identification of the analyte. Estimation of an analyte with an example being a drug in a matrix sample containing the analyte is done here.